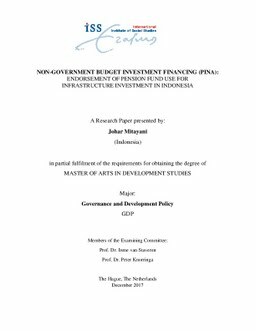 Indonesia’s financing gap in infrastructure has encouraged private sector participation, one of them is pension fund. Through Non-Government Budget Investment Financing (PINA) scheme, pension fund’s involvement in infrastructure sector has begun. As infrastructure and pension fund carry the political and social-economic vibe respectively, the decision making investment is framed with political support from the government and economic examination by pension fund. The government takes combination of custodian and demiurge roles by providing accommodated regulations, enforcing state-owned enterprises preference, endorsing supported policies and structure which subsequently should be dealt by the pension fund in the economic perspective. Nevertheless, the endorsement of pension fund involvement in infrastructure is lacking the foundation of shaping pension fund’s character as a true institutional investment, that is, pension fund reform. Without the pension fund reform, the involvement might be short-lived.